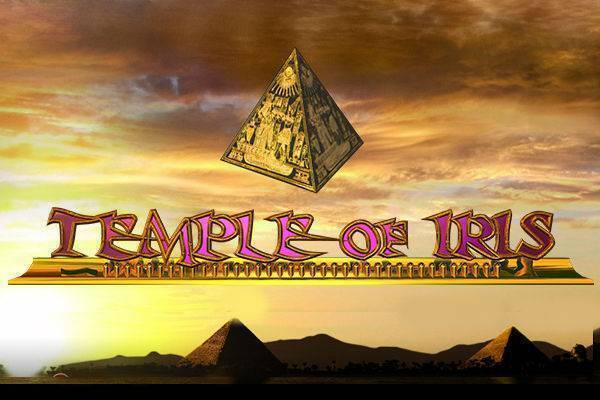 Temple of Iris is 5-reel, 25-payline slot that mixes ancient Roman theology and Egyptian symbols to give you a shot at big prizes with free-spin bonuses and a 95% RTP. Its superb graphics render the symbols of ancient Egypt, focusing on the unearthly lady known as the Messenger of the Titans. She has no mythology to call her own, instead serving as a kind of waitress or errand-girl, serving nectar and various goodies to the other gods and goddesses. The game developers at Eyecon brings her to us along with a set of Egyptian-themed symbols. Give this slot a spin at one of these trusted online casinos. To start playing Temple of Iris, set your bet in “Change Bet” by setting your stake to between £0.01 and £0.50 per line. Then in “Change Lines” adjust the number of paylines you wish to wager on by selecting Line Up, Line Down or Max Lines. You can also opt just to lean back, take in the pyramids, and enjoy the Auto Play option. There you can set the game to play up to 100 spins in a row with a variety of stop options. The lovely priestess in the flowing white gown is the Wild, substituting for any other symbol exception for the Scatter. The wild tops regular game payout, with a stunning 9,500x bet prize for landing 5 on an active payline. Even 4 will bring you 2000x. The scatter symbol is the Pyramid. 3 or more anywhere on the reels will trigger Free Games, where you can enjoy 15 free spins with a triple multiplier. 5 scatters can also win a tidy 450x on top of sending you into the free spin sequence. Card symbols A down to 9. 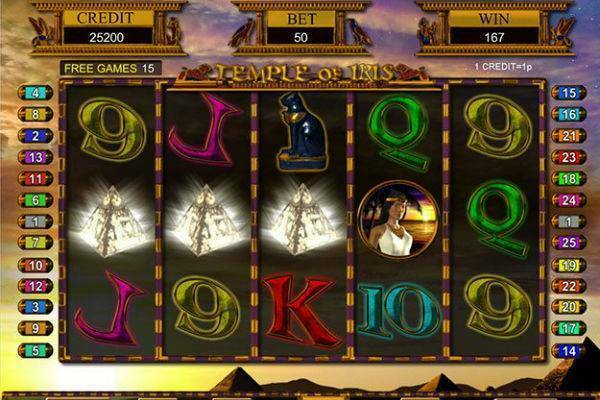 Temple of Iris does offers some great fixed prizes which can reach the jackpot level with 9500x bet in the regular game when you spin 5 of the Iris Priestess symbols. But the real money can kick in during the Free spin games, in which you can triple prize wins and take your chances at double or nothing on the Gamble game. You can win up to 3,000,000 coins. Not too shabby. Free Games: Appearance of 3 or more Pyramids triggers this bonus feature, which gives you 15 free spins and a 3x multiplier on any prize you win during these games. If more Pyramid scatters land whilst the free game sequences are in progress, then the bonus feature will re-trigger with additional free spins being added to any you have already been awarded. Gamble Game: For the brave of heart, the Temple of Iris Slot makes available a kind of double-or-nothing sequence. Start it after any payline win by pressing the Gamble tab. This will lead you to a second screen game, in which you must guess if the next card drawn will be red or black. If you guess right, you will double your prize and keep at it till you get 5 correct in a row or reach a cool 3 million coins in winnings. At any time you can opt the Gamble game by clicking the button labeled Take Prize. Ancient Egypt themes are popular in the world of video slots, and Eyecon does a decent job in the visual design. Engaging symbols and background graphics conjure the feeling of mystery and magic within an ancient temple blending two ancient cultures, which still exert a powerful tug on our imaginations to this day. Along with background sounds and celebration sound effects for the reel action and wins, you will feel that Iris is doing her job as a messenger, hopefully of good fortune for you. Temple of Iris from Eyecon is slickly done and entertaining in its gameplay. Its RTP is a middling 95%, but its offers the chance for truly big wins worthy of the gods. The excitement comes from landing 4 or more of Priestess Wilds, with its huge line wins, or getting 3 or more pyramid scatters to kick off the potentially very lucrative free spins sequence. Go take a peek inside the Temple at one of the casinos recommended here!